Visiting the park last Friday night felt like stepping back in time. 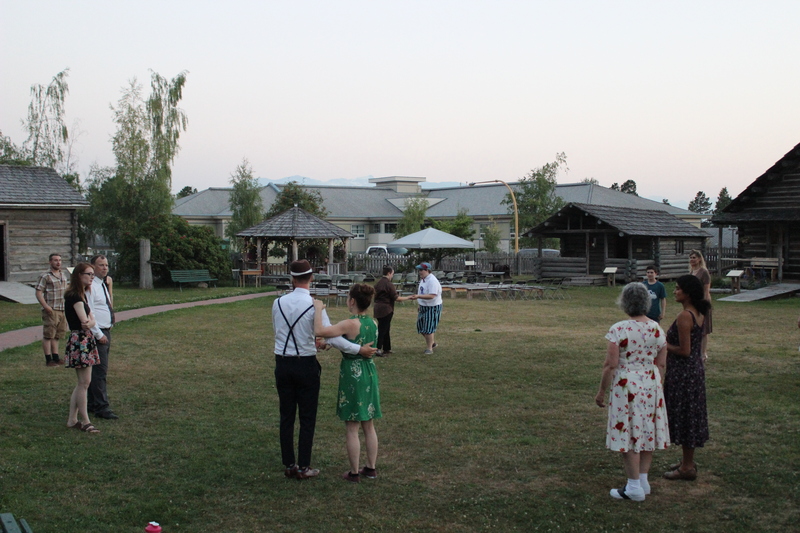 Swing music filled the air as people – wearing their best flowy dresses and button-up shirts – spread out over the lawn, visiting and dancing. 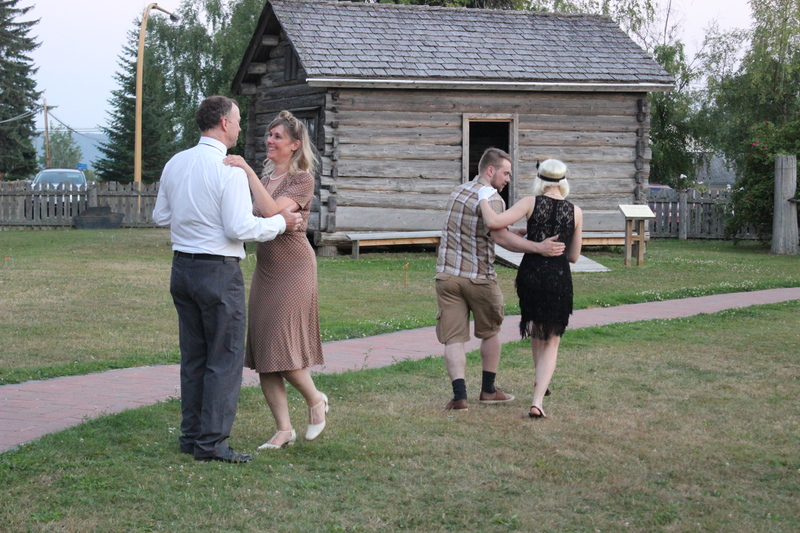 Dixie’s Dance, Heritage Park’s 1930s-themed dance on July 27th, was organized to showcase the Dix Dance Hall and the extraordinary family that built it. The family operated the hotel during the summer months and lived in town over the winter. In addition to running the hotel, Everett was also a trained taxidermist. Although the hotel was accessible by road, it was still remote. One winter Ethel had to walk part of the way into town because approximately 3 miles of road hadn’t been plowed. In late 1928, Dixie, her father and her horse Neto worked together to build a dance hall next to the hotel. Dixie’s daughter Leah visited Heritage Park several years ago, and said that her mother was used to living in bigger cities, and felt lonely and isolated at Kalum Lake; the dance hall was a project to both keep her busy and attract more locals to the hotel. The dance hall provided entertainment for people from all over the region, especially young women hoping to meet the rich tourists staying at the hotel. Depending on where they were coming from, the journey by car or wagon would have taken a good portion of the day each way. John DeKergommeaux also played in a band on Saturday nights at the Dix Dance Hall. The Dixes’ time in Terrace was cut short only a few years later, however. In August 1933, Ethel died after a prolonged illness. In October of that same year, Dixie married Charleston “Charlie” Cauthers and the couple moved to Anyox, BC. Dixie and Charlie had two sons and three daughters (including Leah, as mentioned earlier). The family returned to Terrace but later moved east to Alliston, Ontario. By 1934, Everett had leased the Kalum Lake property to R. W. Riley, the druggist in town, and moved back to Detroit. Though their time in the northwest was eventful, at times tragic, and relatively short, the Dix family brought a lot of joy to the people of the region. Dixie’s Dance, held on July 27, 2018, was organized as a tribute to the Dixes and was the first dance held in the dance hall for approximately 85 years. Although it was 35 degrees, approximately 50 people of all ages braved the heat to attend our dance. Jayden Rogers played the viola as people arrived, and Zachary Park from The Music Room gave a beginner swing dance lesson. 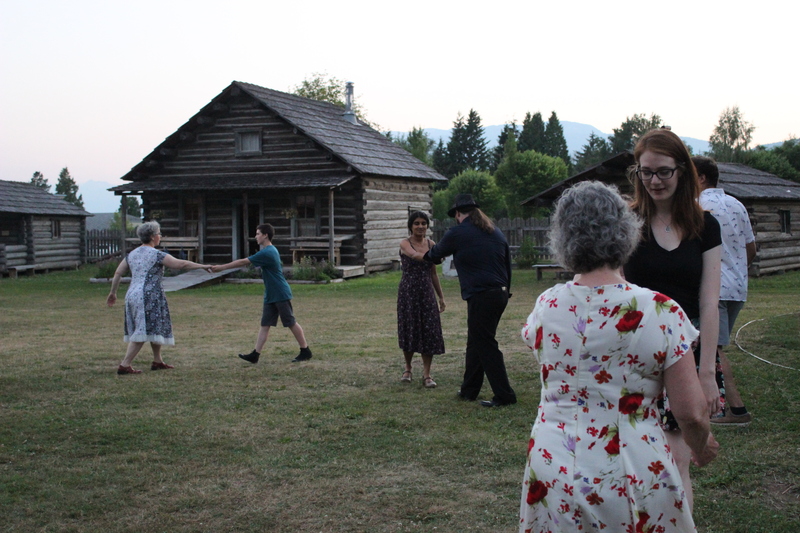 The Dance Hall was very warm so the everyone quickly moved outdoors, and danced until the sun went down. Thank you very much to everyone who supported this event, and helped us bring the Dix Dance Hall back to life!